Thirty years ago on April 26th, 1986, a routine maintenance test at the Chernobyl Nuclear Power Plant in northern Ukraine took a disastrous turn. After midnight, there was a catastrophic chain reaction in the core of the reactor. A power surge fractured the uranium fuel rods, and a huge explosion blew the roof off the reactor. A large amount of radioactivity, both particulate and gaseous, was released into the atmosphere, reaching as far as Sweden in Northern Europe. 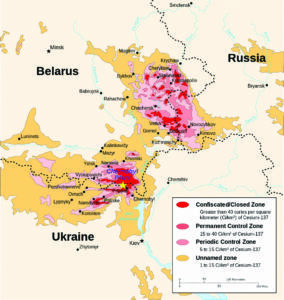 In terms of territory, Belarus suffered the most from exposure to the Chernobyl disaster. This is because Belarus, specifically the Gomel region, was very close to the Chernobyl Nuclear Power Plant. According to the United Nations (UN), the estimated financial cost of the disaster for Belarus was $235 billion. Since then, about nine percent of Belarus’s annual budget covers the continuing costs associated with the consequences of the disaster. Infrastructure has been improved in some affected areas where residents were not resettled, and the government has also revitalized affected agricultural land utilizing special fertilization, lining of soils and cesiumbinding additives. Every global catastrophe leads to terrible consequences, such as death or disease. However, catastrophes can also be important lessons for humanity. Of course, only if mankind is able to learn the hard way. In actuality, time has shown that humans are unable to learn from their mistakes. The main argument to support this is that wars are often repeated. Although, there is hope that mankind can learn from its mistakes. Belarus, following the Chernobyl disaster, has called on humanity to be careful in using nuclear technology. The Belarusian government has called on countries to work to create defenses against sudden nuclear disasters. Importantly, the government reminds the world that the dangers associated with nuclear energy are not just computer games, but are a real threat to the existence of our civilization. Consequently, Belarus has served an important role in providing expertise to the world community about nuclear containment and rehabilitation. Although Belarus does not have any nuclear power plants, the country does have authority to speak on the dangers associated with nuclear energy because of the suffering its men, women and children experienced during and following the Chernobyl disaster. In March 2011, Japan faced the biggest nuclear disaster since the Chernobyl disaster, at the Fukushima Nuclear Power Plant. The damage caused by a tsunami produced equipment failures, and without this equipment, an accident followed resulting in three nuclear meltdowns and the release of radioactive material. Although the nuclear disaster in Fukushima was primarily initiated by a natural disaster, the same fate could have been in store for parts of Japan’s north-east coast. As part of its dedication to the international community, Belarus will further participate in round table discussions, in order to review international Chernobyl experience in the context of the United Nation’s activities in response to future technological disasters. The tragedy associated with the Chernobyl disaster continues to be remembered even in other parts of the world. On April 20th, 2016, a photo exhibition named Chernobyl: Tragedy, Lessons, Hope was opened at the UN headquarters in New York, featuring the work of American photographer Philip Grossman on the current state of the exclusion zone around the Chernobyl Nuclear Power Plant. The exhibition was opened by the Minister of Foreign Affairs of the Republic of Belarus Vladimir Makei and the Administrator of UN Development Program Helen Clark. Makei, in his commemorative speech, called the 30th anniversary of the Chernobyl disaster a reminder of the need to carefully preserve the ideals associated with the value of human life and with responsible attitude towards the environment. He also stated that what is needed is not only political and economic measures, but human dialogue, understanding, cooperation and empathy. As the coordinator of international cooperation on Chernobyl, Clark noted the importance of the work continuously being done by Belarus, in order to carefully preserve the Chernobyl experience in the interest of all nations and future generations.